Struck in the foot by a line drive while umpiring at second base, Ed Hickox was out of the lineup Wednesday in San Francisco. Ed Hickox calls umpire interference. 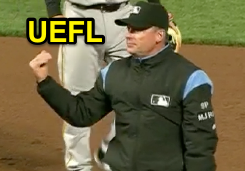 With two out and two on (R2, R3) during Tuesday night's Pirates-Giants game, Giants batter Buster Posey hit a line drive up the middle and toward 2B Umpire Hickox, who stood in the Deep B (really deep) umpire's position. In attempting to avoid the batted ball, Hickox inadvertently stepped into the baseball with his left foot, kicking it to shortstop, before coming down awkwardly on his left leg. Remarked Giants broadcaster Mike Krukow, "the way he came down on his knee, I'm concerned about it." Hickox and crew then enforced Umpire Interference Rule 5.05(b)(4) ("The batter becomes a runner and is entitled to first base without liability to be put out [when]—A fair ball touches an umpire or a runner on fair territory before touching a fielder. If a fair ball touches an umpire after having passed a fielder other than the pitcher, or having touched a fielder, including the pitcher, the ball is in play"), placing Posey at first base while sending baserunners R2 and R3 back to second and third base, respectively. Related Post: Rules 2.00 & 6.01(f): Umpire Interference (7/5/12). Triple-A call-up Shane Livensparger replaced Hickox for Wednesday's game at AT&T Park. Relevant Injury History: Though Hickox has sustained concussions, there are no lower body injuries on file.